While this is an important children’s book to read, it is not a typical children’s book at all. This is a true story, told by Latina actress Diane, rewritten from her adult memoir. While she tries to make it friendly to young people through using contemporary slang, etc., nevertheless, this is still a story told by an adult. Why am I featuring it? 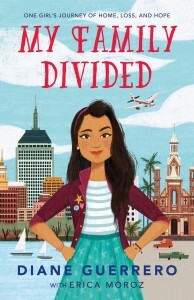 Because I think high school classrooms could make use of this children’s book to bring to life the discussion of contemporary policies regarding immigration, and to have a hard look at the effect. The most memorable part of the story for me, was when Diane reveals that the night her parents were deported, she was left alone in the house, and no one from the government even knew or cared that she, a 14-year-old, was suddenly left completely on her own. Even worse, if they did care, they would then put her in foster care, and end her ability to reach out to her parents. The remainder of the children’s book is how she coped, from that moment of hiding under the bed, to her own bouts with depression, to becoming a well-respected actress and voice for the Latinas. The important take-away from this book is – don’t give up. Find someone who can help you see the best in yourself. This is a sad but important story for today’s young adults to read. I applaud Diane for her life, and for her ability to speak about it articulately.